Only young asparagus shoots are commonly eaten: once the buds start to open the shoots quickly turn woody and become strongly flavoured. Asparagus is low in calories and is very low in sodium. It is also a good source of vitamin B6, calcium, magnesium and zinc, and a very good source of dietary fiber, protein, vitamin A, vitamin C, vitamin E, vitamin K, thiamin, riboflavin, rutin, niacin, folic acid, iron, phosphorus, potassium, copper, manganese and selenium, as well as chromium, a trace mineral that enhances the ability of insulin to transport glucose from the bloodstream into cells. The amino acid asparagine gets its name from asparagus, the asparagus plant being rich in this compound. Asparagus can also be pickled and stored for several years. Some brands may label shoots prepared this way as "marinated." The bottom portion of asparagus often contains sand and dirt and therefore thorough cleaning is generally advised in cooking asparagus. Description: A perennial, asparagus are spear-like shoots that come in three main varieties: green, the most common; white, for which the green variety is field blanched; and purple, an extra sweet and tender variety that turns green when cooked. Selection: Look for spears with tight buds and smooth skin. Asparagus should not be withered, brown or limp. Smaller spears are especially tender. Storage and handling: Store asparagus upright with water at its base for 2-3 days in the coolest part of the refrigerator. Rinse well before using, especially around the scales. Preparation: Snap the stems where they naturally break to remove the woody bottom portion. Cut into pieces or use whole spears. Steam (or cook in a little water) about 5 minutes, until crisp tender. Microwave about 5 minutes in a covered dish with a little liquid. Roast with garlic (SIS, p. 51). 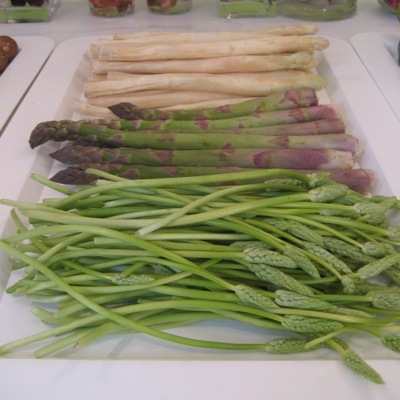 Serving suggestions: Serve raw asparagus in salads (SIS, p. 46) or on a vegetable tray. Season cooked or roasted asparagus with balsamic vinegar or lemon butter. Use peeled stems to flavor soups. Nutrients: Vitamins A, C, K, thiamin, riboflavin, folate; iron; fiber. Cook the asparagus with the penne 10 minutes until al dente. Fry and mash the anchovies in olive oil. Add the drained penne and asparagus. Cook well about 2 min. Season with salt and pepper. Variation: Use artichoke hearts or fennel. Place cut side up on a cookie sheet covered in foil and bake in a 200° oven overnight for at least 8 hours, or until dry (larger tomatoes take longer). Much better than store-bought, very tender with more tomato flavor, they keep in the fridge for months. Can be stored in olive oil, chopped garlic, peperoncino and oregano. Bunch up the spinach and juice with the celery the set aside. Juice the asparagus with the tomato. Combine the two mixtures, stir and garnish with the cherry tomato.